Do not add more low-acid ingredients (onions, celery, peppers, garlic) than specified in the recipe. This may result in an unsafe product. Don't add substantially more seasonings or spices, these items are often high in bacteria and excess spices can make a canned item unsafe. I doubt whether increasing a spice from 1 teaspoon to 2 in a batch of 7 quarts will have any adverse effect, but use some common sense and don't go overboard. butter or fat may also slow the rate of heat transfer, and result in an unsafe product. Thickeners - With the exception of "Clear-Jel" which has been tested in USDA and university food labs, do not thicken with starches, flour, or add rice, barley or pasta to canned products - this applies to both savory products (such soups and stews), sauces and pickled items. Items that thicken products will absorb liquid during processing and slow the way in which the food heats. Under-processing and unsafe food could result. DO add acid (lemon juice, vinegar or citric acid) to tomato products when directed in the recipe. In 1994, food scientists proved the risk of botulism poisoning from canned tomato products, and acid is now added to canned tomatoes, even to those canned commercially. Lemon juice is widely available, but will add a sharp note to canned tomatoes; citric acid will change the flavor less noticeably, and vinegar is part of many recipes anyway. If necessary, you can balance the tart taste by adding sugar. for jams and jellies, instruct you to simply seal hot-filled jars, or to invert the jars as the final step. I know of no reputable source (university food science departments, the USDA, FDA, National Home Canning Center, etc.) that recommend either "open-kettle canning" or inverting jars as the final step, as unsafe final products may result. Never process the jars in any oven (electric, gas or microwave). Steam canning is also, pretty broadly NOT recommended. There ARE a couple of manufacturers selling steam canners, but you'll find virtually no credible authorities recommending them, for a variety of reasons, starting with basic heat transfers properties of steam vs. water. Increase water-bath processing times at altitudes of 1,000 feet or more to compensate for the lower temperature of boiling water at high altitude. I've tried to be sure to include the conversion charts in all recipes for this. Put the cut fruit in a solution of 1 teaspoon ascorbic acid (vitamin C, available in a powdered form from the drug store) and 1 gallon water. Drain before canning. Put the cut fruit into a lemon juice solution (3/4 cup lemon juice to 1 gallon water). Drain fruit before canning. Canning jars. Use standard mason / Ball / Kerr (etc.) jars for home canning. Commercial food jars that are not heat-tempered, such as mayonnaise jars, often break easily (although, I've had great luck with "Classico" brand quart spaghetti jars. Note that the Classico's manufacturer does not recommend reuse of their jars: here is what they say on this page). 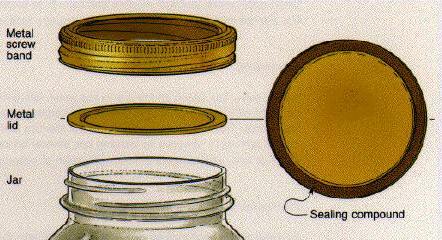 Sealing also can be a problem if sealing surfaces do not exactly fit canning lids. Be sure all jars and closures are perfect. Discard any with cracks, chips, dents or rust. Defects prevent airtight seals. Do not use jars larger than specified in the recipe, as an unsafe product may result. It's almost always ok to go smaller. Generally speaking, quart jars are the largest size you should use. To remove scale or hard water films on jars, soak several hours in a solution of 1 cup vinegar (5 percent) per gallon water. Keep the jars warm until ready to fill (to reduce breakage from thermal shock). The flat lids can be used only once, but the screw bands can be reused as long as they are in good condition. Read Do not reuse lids from commercially canned foods. Check jars for seals within 24 hours of canning. Treat jars that fail to seal properly as if they are fresh (refrigerate and eat soon). Fill the canner at least halfway with water. A little practice will help you to know how much water you will need to start out with to ensure the jars will be covered by at least 1 inch of water. Preheat water that is added to the jars (when called for) to very warm but not boiling (around 140 degrees F) for raw-packed foods (the lower temperature helps to reduce jar breakage) and to boiling for hot-packed foods. Put the filled jars, with lids and rings on, onto the canner rack and use the handles to lower the rack into the water. Or you may fill the canner, one jar at a time, with a jar lifter. Obviously, you'd need to be quick, or the first jar could be in the bath for substantially longer than the last jar you add. If you don't use a jar rack, then a flat rack on the bottom helps to reduce break. One of these comes with each canner. Always add more boiling water, if needed, so the water level is at least one inch above the tops of the jars. Turn heat to its highest position until the water boils vigorously, and then set a timer for the minutes required for processing the food. Cover the canner and if necessary, lower the heat setting to maintain a full but gentle boil throughout the processing time. Generally, I find I need to keep the burners on high. If one burner doesn't produce enough heat to keep the water boiling, you can usually straddle two burners with the canner. When the jars have been boiled for the recommended time, turn the heat off and use a jar lifter to remove the jars and place them on a towel in an area that is not drafty, leaving at least one inch between the jars during cooling. Do not retighten the jar lids - it may break the seal. Do not leave the jars in the boiling water after processing time is done, because the food will become overcooked. Check the jar seals 12-24 hours after processing for leaks and broken seals. Just press down on the lid. If it seals, it will be sucked down tight. If it did not seal, it will flex and make a popping sound each tip. See this page for more information. To store, remove the screw bands and wipe the jars clean. Otherwise, the rings may rust tight to the jar! Any jar that fails to seal can be reprocessed in a clean jar with a new lid. Reprocess within 24 hours. Generally, it is better to refrigerate the jar and use it within several days. The jar may also be stored in the freezer if the headspace is adjusted to 1-1/2 inches to allow for the expansion of the product.